While most of the cinematic community found itself striking out to the theater for Denzel Washington's "Taking of Pelham 123" I chose to stay behind and indulge in Denzel Washington's 1989 film "The Mighty Quinn" in the comfort of my own living room. Essentially "The Mighty Quinn" fits into that most tried & true of so-called genres - the murder mystery. Based on A.H.Z Carr's novel "Finding Maubee" the story involves Xavier Quinn (Washington), a police chief on a Caribbean Island I thought was Jamaica, though the archived New York Times review of the movie I read today advises it isn't really Jamaica but a "Jamaica-like" island. An American businessman turns up dead in a jacuzzi at a most opulent resort owned by a suspicious Englishman (James Fox) whose wife (Mimi Rogers) seems an awful lot like a femme fatale. Immediately the main suspect seems to be Quinn's boyhood pal, an infamous local drifter named Maubee (Robert Townsend) who Quinn happened to (almost literally) run into on his way to the hotel. The island's governor, as is typical of politicians in murder mysteries, fears tourism will be disrupted if the investigation carries on too long and urges Quinn to take in Maubee at once. Then there is the inevitable shifty, floral-print shirt wearing American who we know is not all he seems once we realize he is played by M. Emmet Walsh. Oh. Right. Quinn also has an ex-wife for whom he still seems to pine (and you would too if you saw her sing reggae) and a young son who we are introduced to when, ahem, Quinn forgets to pick him up from school. I know what you're thinking but despite the familiarity of the primary pieces the film isn't entirely familiar. So often these murder mysteries are nothing more than what the genre term implies. A detective is presented with a mysterious murder and investigates it. He or she is sketched a little bit but the movie focuses 98% on the procedure and nothing more. "The Mighty Quinn", on the other hand, invests a great deal of time in both character and atmosphere. Especially atmosphere. For example, there is a sequence midway through the film when Chief Quinn enters a club and the club comes to a standstill because, after all, he is the Chief and is looking for Maubee and no one wants to help. But Quinn saunters to the stage at the head of the club and sits down at the piano and starts to play and before long the entire club has broken out into a reggae-influenced version of Bob Dylan's song from which the film gains its title. It is wonderful - just wonderful. But if this movie gets made today there is no waaaaaaaaay that scene gets included. The studio exec asks the writer of this scene "What's the point?" and then the writer takes the letter opener off the studio exec's desk and stab himself in the heart. Also consider how one of the film's foremost clues, a mysterious $10,000 bill, makes its appearance. It could have just been tossed in, no regard for how or why so long as it's there and we understand its importance. But the movie builds an entertaining sequence around it. Anymore movies of this sort seem to possess no intent beyond tricking us, making us playing a guessing game, while forgetting one of the most fundamental reasons we go to the movies - that is, to be entertained. "The Mighty Quinn" entertained the hell outta me. 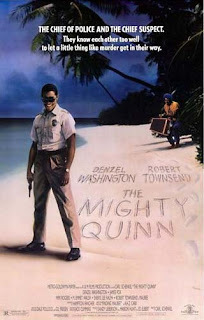 Murder mysteries are still going to get churned through the pipeline by the dozens and, thus, I wish moviemakers would use "The Mighty Quinn" as a blueprint. When the twist comes at the end, as it must, it doesn't leave you thinking "I did (or did not) see that coming." It just leaves you thinking, "Nice. I'm glad that happened." the murder mystery depicted in the film still lingers in my mind, if I m not wrong. INostalgia relly helps one to have breathing space in too busy a life. While I generally use this space to mock, insult or agitate you, I'd like to take a break from the norm to thank you. I watched this on HBO when it first started airing, and I liked it at the time. But I had all but forgotten about it in the years since. So thanks for the reminder, and I've now added this to my Netflix list.